Personal Responsibilty and Being Prepared/What if? Lets talk…seriously, lets have a dialogue here and now about personal responsibility because at the heart of being ‘prepared’ is the idea of personal responsibility and taking responsibility for your future. Is personal responsibilty dead? Not for those who are ‘prepared’, not for those who deal with life on life’s terms… Its not about fear, its not about being afraid of the unknown nor being angry with politicians or corporations nor about feeling like the sky is about to fall in, though certainly these can all be catalysts and a spring board for wanting to be prepared and personal responsibilty is often at the heart of people doing the right thing…(is that why we are so fascinated with the news? are we looking for those who are responsible? examples that justify us in not being responsible ourselves?) It is well known and understood that human beings are generally self-seeking, self-centered and very short sighted…we would do well to remember that this is part of immaturity and that as we age, we are somehow supposed to outgrow this and become ‘mature’, meaning, we become ‘responsible individuals’ and personally responsible for our actions or lack there of and not expect to remain forever in a state of immaturity. The mature adult is rational and can see outside of him/herself and can see beyond the immediate, in the now, moment and can rise above base impulses sent forth from the reptilian part of the brain that seeks only to ensure its own survival and pleasure (though it is useful in dangerous situations!) It seems to me that over the past few decades, that many people have abdicated their personal responsibility in making responsible choices that not only take into account their own wants, needs and desires but those with whom they interact either directly or not. We as a people have chosen, even subconsciously, to allow others to take of us and decide what is in ‘our best interests’ and to ‘make’ us safe for whatever reasons so that ‘we’ may just listen to that part of the brain that tells us ‘if it feels good do it’ and not have to worry about our future and instead, be continual children under the hand of a parent. For some, it is out of necessity because we/they simply struggle to make ends meet and can’t for a moment look up and raise their voices…for others, it is because they made choices and decisions that put themselves in a position where they couldn’t say anything or do anything to help themselves, others, it is simply because they are too wrapped up in ‘getting ahead’ or simply don’t care because, after all, they are ‘safe’ and don’t do anything outside of the ‘norm’ and they aren’t ‘responsible’ for everyone else, aftger all, that is why they vote, so that others can speak for them…the list of WHY people have abdicated their own responsibility for their own lives is long and never straight nor simple. And many of, even though we are, in general, very responsible adults, sometimes make mistakes that cause us to abdicate our personal power/responsibility…to err is human and to gain wisdom is divine from our mistakes…to keep on making these mistakes, well, that would mean we aren’t responsible now wouldn’t it? Now, these are bold statements and may make you angry or sad…and you can disagree on the reasons why I feel that we are a nation of people who have abdicated personal responsibility to others, but we must admit, if all of US and that includes corporations, groups of individuals down to individuals have or had consistently taken personal responsibility for ourselves and actions, then we wouldn’t be living in a country that has a penal system that has exploded, with a social services system that can’t cope, with unemployment running rampant, with big government and regulations strangling businesses and people feeling the need to take to the streets in protest out of anger, frustration and finally waking up to fact that they have been asleep at the wheel for too long and now there is a train wreck in their front yard. Regardless of where you fall politically, religiously, ideologically…regardless of your race, color or creed, the core of being an productive member of society is personal responsibility and doing the ‘right thing’. I am not here to argue the finer points or details, merely to express that personal responsibility is ‘ours’ and ours alone and that as individuals we cannot and should not expect others to take care of us and mind the chickens that we have. To expect others to protect us fully and with our best interests at heart is to invite control over our lives. To expect that others will ultimately know what is best for us and ours is to invite intrusion into our lives and potential upset when we disagree or finally decide that we know what is best for ourselves. To give up our rights as individuals in the name of ‘safety’ is to invite control into our lives that destroys our rights. But to expect that we can do whatever it is that we wish to do without consequences or that someone else will take care of it also invites control of our lives by outside forces. With rights come responsibility and that responsibility ultimately rests on our own individual shoulders and begins with personal responsibility. And THIS is ultimately what is at the heart of anyone who prepares for whatever situation that comes into their lives. It is a guiding force that no one and nothing can take away from someone. To be a responsible individual you cannot go on wild spending sprees with credit cards and then not pay the bill. You can’t be a responsible individual and drink and drive…you can’t just eat whatever you want and then wonder why you have diabetes later on in life and you can’t NOT VOTE and then complain when a new law comes down taking away your right to own a fire arm or complain because you don’t like how things are handled. Personal responsibility is ACTIVE not passive. Personal responsibility is not just about you but in seeing the big picture and how your actions will have an impact upon others and then making a decision that will harm the fewest people and places and is in the best interest of all concerned without prejudice. (And yes, we do have that responsibility to have the wisdom to see how our actions may or may not support others that is part of being a grown, mature adult, its about not just thinking of ourselves). And collectively we should be responsible too…however, that is not the point of this blog article, the point is that the chickens are coming home to roost…for too long, too many have abdicated their personal responsibility, placing their trust, like a child, into people with whom they also placed their futures and now face reality or not. For those of us who are personally responsible for ourselves we prepare for life on life’s terms, we do not hand over our lives to strangers who may or may not have our best interests at heart, whom, for whatever reasons, may have agendas that suit their own sense of ‘personal responsibility’ but that may not match our own. When we recognize we may have made a mistake, we don’t run from it nor expect someone else to clean up our mess…we get into it, make amends and do what we can to remedy the situation and then get up and go forth, hopefully never to repeat the problem again. We, as personally responsible people seek not to force our opinions upon others, but make our opinions heard and then allows others to form their own opinions, whether we agree with them or not and keep on going. We support ourselves, don’t expect help but ask for it when we truly need it…we do what we can, when we can to minimize the help we need, but we are not infallible fortresses, one-man armies nor an island. We can see when others need our help or opinions or perhaps some sound advice and give it, not to engender them to ourselves but give them a hand up so that they too, may become personally responsible. And we are personally responsible in that we do no grievous harm to others or at the expense of others merely to promote our own well-being or that of our group. At the heart of someone who prepares for life and whatever may come, ie a prepper, is someone who sees and understands the wisdom of personal responsibility and then does something about it. 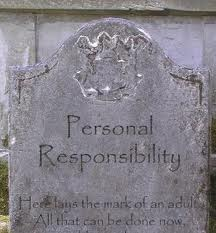 Is personal responsibility so ‘out of date’ that it has become radical and thus something to be feared? Or has it been out of fashion for so long that to be personally responsible for ourselves, our family, our friends and our country and our world is something that we have lost the ability to be so? I think not, for to be personally responsible is a minute to minute, day to day choice and that is why growing numbers are becoming ‘preppers’ or being more prepared. Personal responsible gives one personal power and alleviates fear and calms the stressors in one’s life, is that something to be feared or mocked or marginalized…no, and I am proud to see more and more people in this world, for whatever their reason, becoming more responsible for themselves and their loved ones and becoming prepared to face what life will throw at them in the coming years. It need not be scary nor something that only radicals do, for truly, its all about personal responsibility. Then I start to answer those what if questions and do my best not to assume that a parental hand will come along and pat me on the back or tell me…it will be okay…for I am my own parental hand and it is my personal responsibilty to take care of myself, voice my opinions, think not just of myself but of others too and then do what I need to do to be that hand for myself. It may include saving money for a rainy day, it may include getting extra food into the house. It may include educating myself on the ways of handling minor medical problems and having the tools on hand to do so (not to mention getting the wisdom to know when I can’t do it myself). It may include thinking ahead and planning for those those times that others can’t behave themselves and it most definately means that I act not as a child would in response to external events. It is my sincere wish that anyone who has read this has a light bulb turned on within their own heart and mind and it is my prayer today that maybe, just maybe, that I have helped someone turn the page and begin to realize that they need to be more personally responsible, not just because its the wise thing to do and it will ‘save themselves’ but because it is the right thing to do in all of our interests and perhaps, just maybe, this will, in the end, save someone’s life and help all of move peacably past the turmoil in our world now. And I really have to ask…what would the world be like if most people were personally responsible?